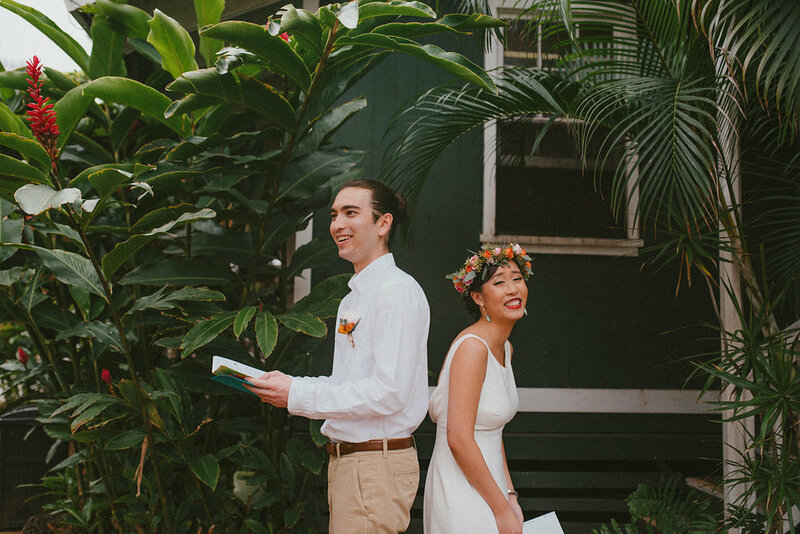 Nestled up against the Waianae mountain range in the small town of Waialua sits what I believe is one of the most unique venues Hawaii has to offer. 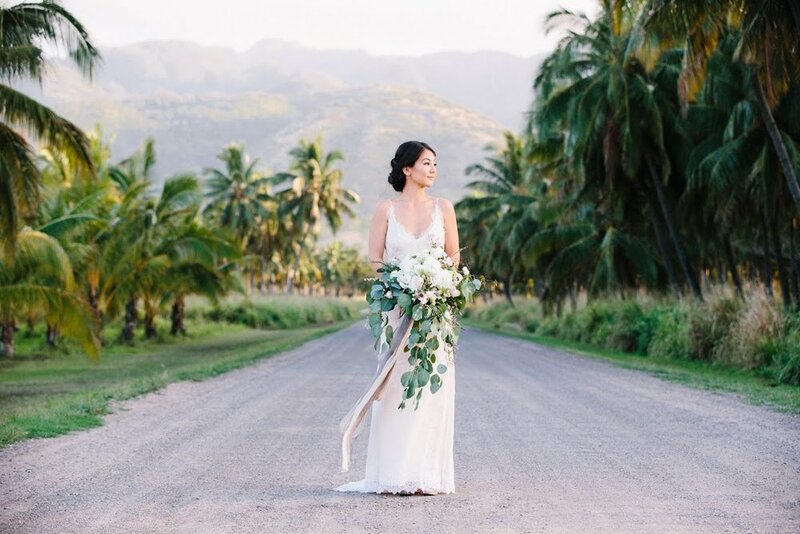 Dillingham Ranch is that perfect piece of heaven for any bride who wants a rustic, ranch style wedding. Once you arrive, you drive down a long dirt road with lush fauna surrounding you. You may pass by a few horses just grazing and may see a peacock or two if you're lucky. At the end of the road is a beautiful ranch style estate set on the foothills of the Waianae mountains. The horseshoe shaped building has everything you need as it is a combination of suites, a lodge, and a kitchen preparation area. 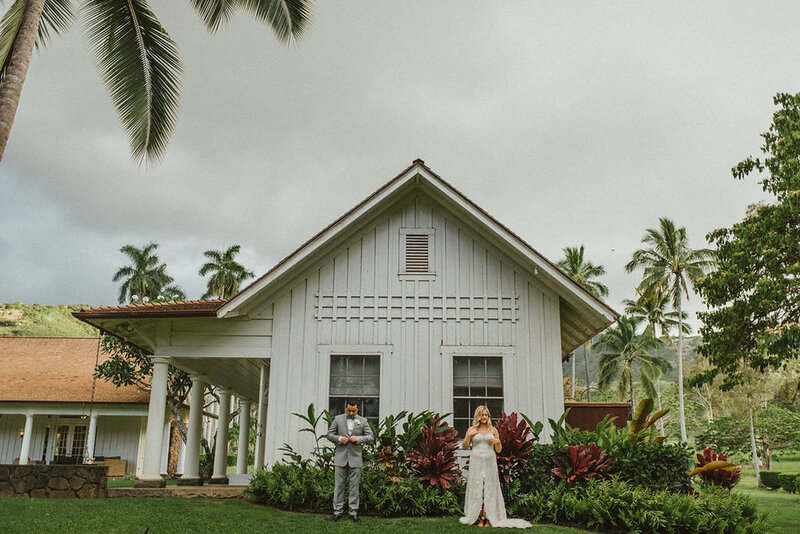 The bride and groom suites are available on either side of the building with adjacent rooms throughout the building and every room is styled to give that "paniolo" or Hawaiian country cowboy feel. A few of our favorite amenities are the outdoor shower and the jack and jill closet so you and your party can hang and organize all of your wardrobe for the big day. The two bride and groom suites are large enough where a party of 6-8 people can sit and lounge comfortably while you are getting primped and pampered. The Bridal Suite is a large spacious room with views of the property. The Groom's Suite sits opposite of the Bridal Suite. The additional rooms have two twin beds to accommodate guests. The outdoor showers are available off of both the Bride and Groom suites. Something that is a great amenity that few other venues have is a prep kitchen. With the reservation of the venue, the kitchen is available to your caterer to prep and store the food. 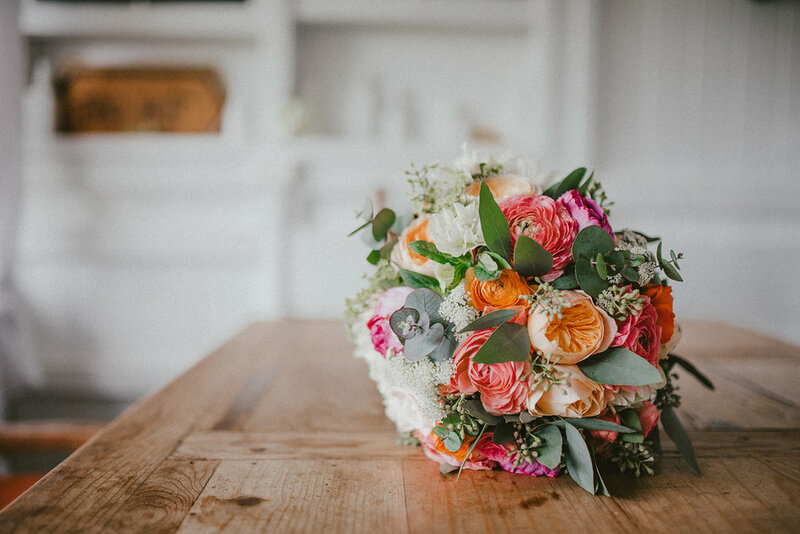 With a complete kitchen, whether you prepare the food yourself or have it catered in, Dillingham helps you take care of that aspect of your wedding. The industrial kitchen is available for use on the day of your event. The lodge or communal area is a large room that is the perfect setting for an informal gathering with your guests. The rustic yet luxe textures and ambiance of the chairs, fireplace, and architecture give the venue a very special touch. The french doors of the lodge open up to a breathtaking view of the ranch's infamous row of palm trees and a beautiful view of the mountains. 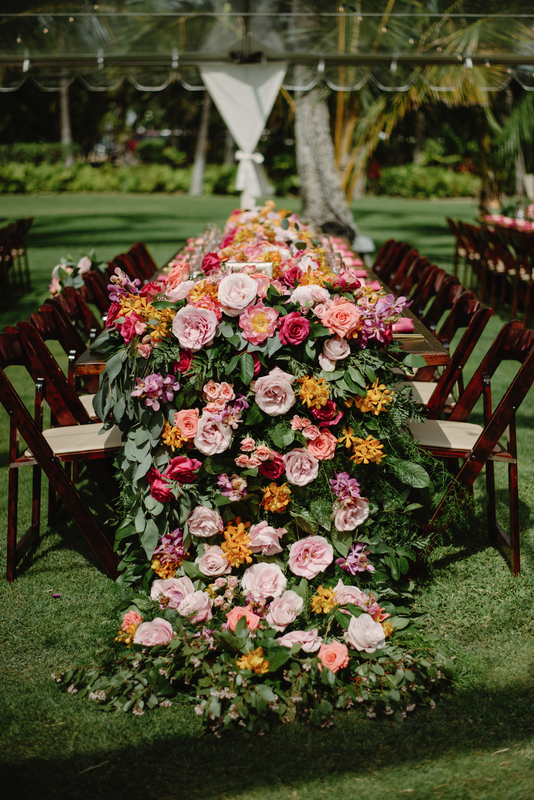 This is one backdrop that will make your wedding that much more special. The lodging area gives a warm, rustic feel. The french doors of the lodge open up to the beautiful rows of palm trees and mountain views. The back of the property can hold large event design and set up. The buildings allow for convenient access from the front to the back. 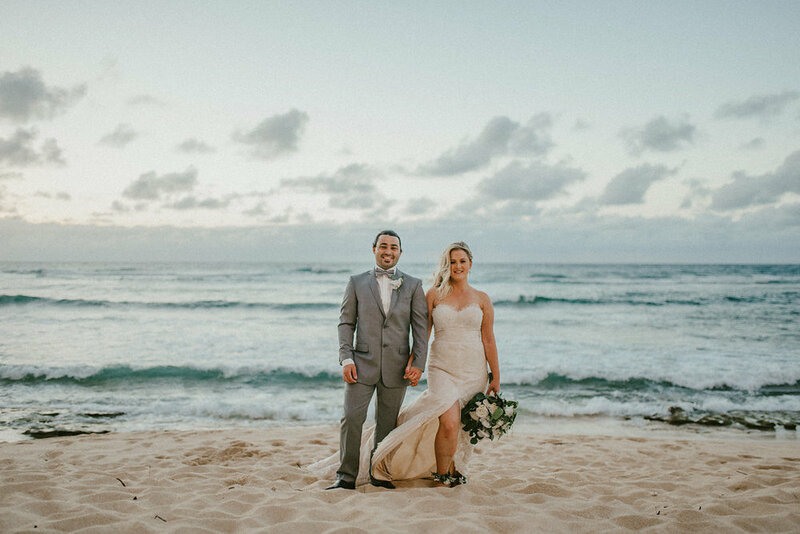 If you want the entire Hawaii experience and want some photos on the beach, not a problem. You can take a short walk across the street to a beautiful, untouched strip of beach that is the ideal spot for a few sunset beach shots. 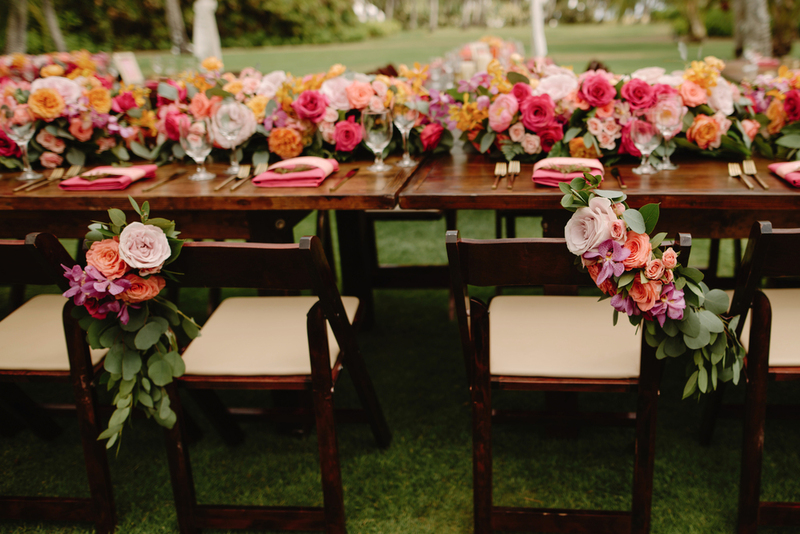 Dillingham Ranch allows you to reserve the venue for three days, the night before the wedding the day of, and the morning after. If you would like to have yourself and your guests stay at the venue, the rate per room is only an additional $200 per night. If you're looking for a venue for an intimate wedding that's away from the bustling city and love that rustic, ranch feel, Dillingham is a perfect location. 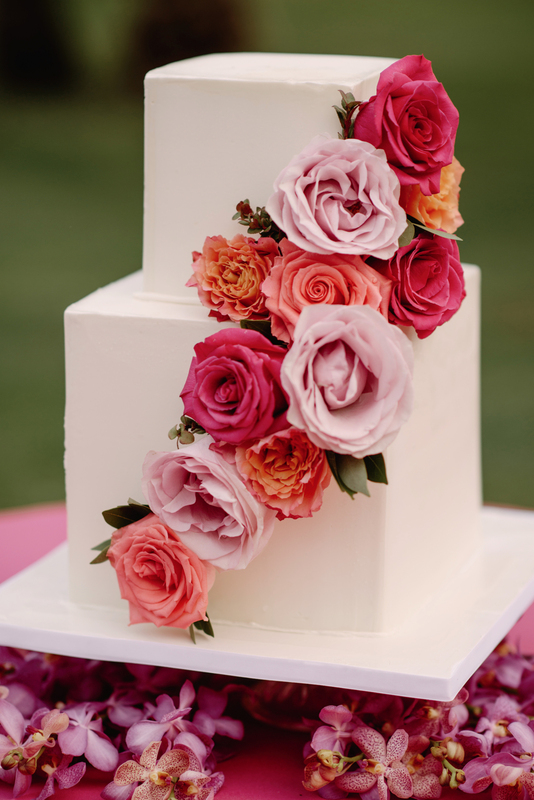 For more information please contact Siri Masterson at dillinghamranchweddings@gmail.com. Congratulations you’re engaged! Now the fun part begins: planning your wedding. 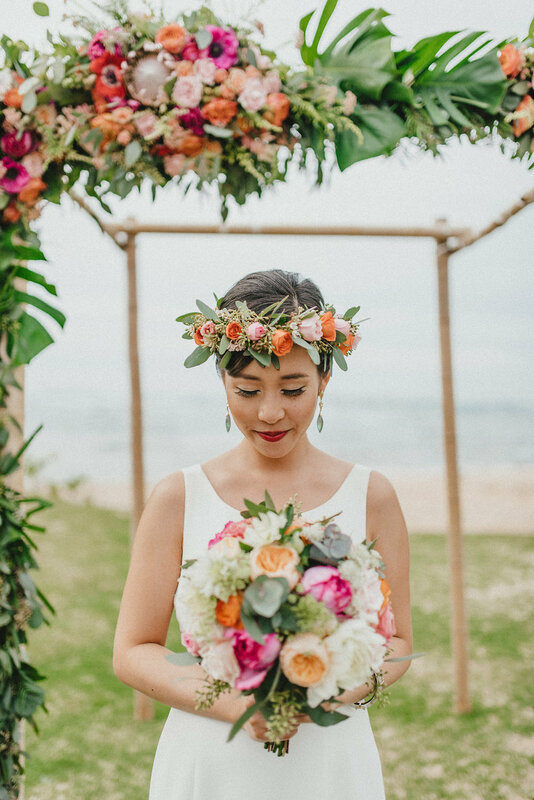 There are so many small details from your dress and flowers to makeup and catering, but one thing every bride usually decides on first is the venue. 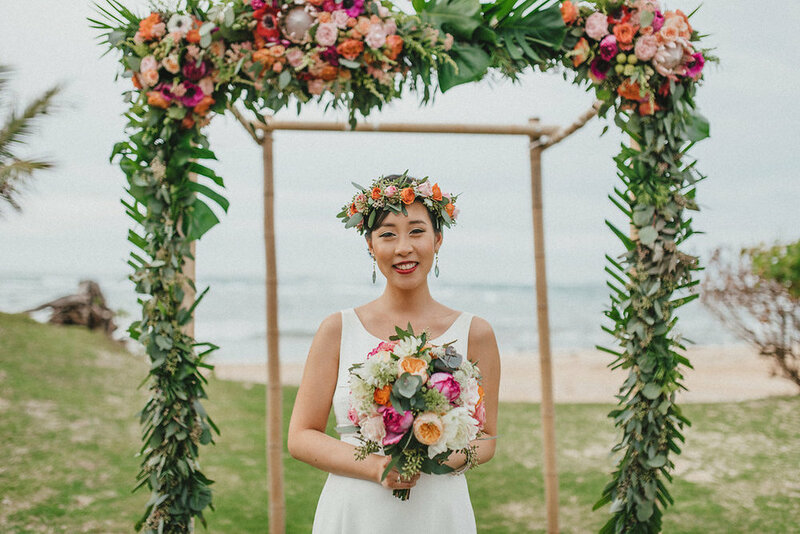 In celebration of all our newly engaged brides, I’m sharing some of our favorite luxury wedding venues on Oahu. Being born and raised in Hawaii, I love the country. I grew up in the suburbs on south Oahu, but I believe I’m a country girl at heart. One of my favorite things to do on my days off is to drive around the island and stop to enjoy the calming sound of the waves rolling on the sand, which is probably why all of them are outside of the busy city and sit quietly in some of Oahu’s small towns. We’ll reveal one beautiful venue each day to help our brides-to-be with the first step to their perfect wedding day. The Four Seasons Resort at Ko Olina, nestled on the west shore, is Oahu’s newest luxury resort. Formerly the Marriott Ihilani Resort, Four Seasons has revived the property to embody the feel and aesthetic of Hawaii. When you first walk into the resort, you’re greeted with an open and quite grand entrance. The airy lobby allows access directly to the Hokulea lounge, which is a cafe by day, bar by night, opening out to stunning views of the cove and Pacific Ocean. There are four restaurants on property all with exquisite fare for varying palettes. Visit La Hiki for the breakfast buffet or if you’re adventurous and want to try some of Hawaii’s favorite pan-Asian style dishes. If you’d like to do a light lunch or dinner with cocktails check out Waterman Bar & Grill while you take in stunning views of the pool and sunset. Noe is known for it’s Italian cuisine as Chef Ryo Takasuka creates delectable dishes that combine the flavors of southern Italy with local seafood. You may also want to check as Noe periodically serves brunch. Fish House is well-known for it’s excellent seafood fare. Open for lunch, cocktail hour and dinner, you won’t be disappointed with original presentation and gorgeous views. One of the warm, inviting seating areas in the lobby. Around every corner are perfectly manicured landscapes with beautiful marina, ocean or mountain views. 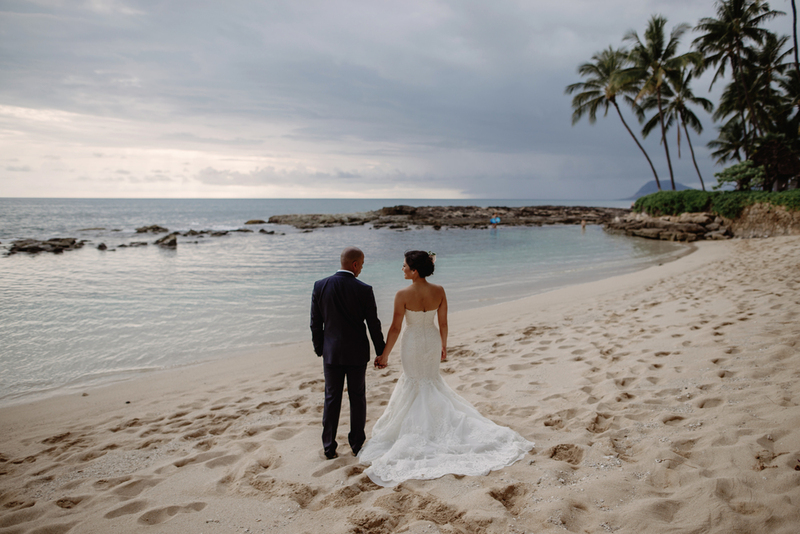 There are several different locations on property to have an intimate wedding with sweeping views of paradise. One of my favorites is the deck that hovers over the cove with picturesque 360 degree views. 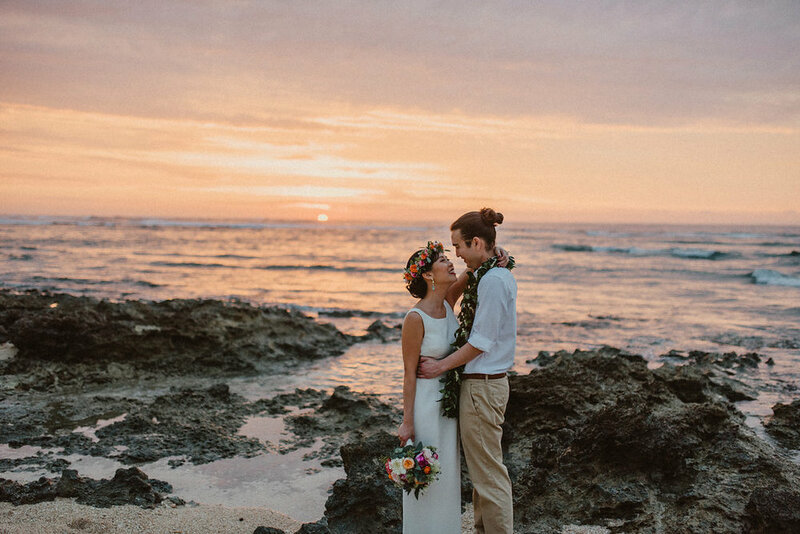 This area is the perfect location for a sunset ceremony. 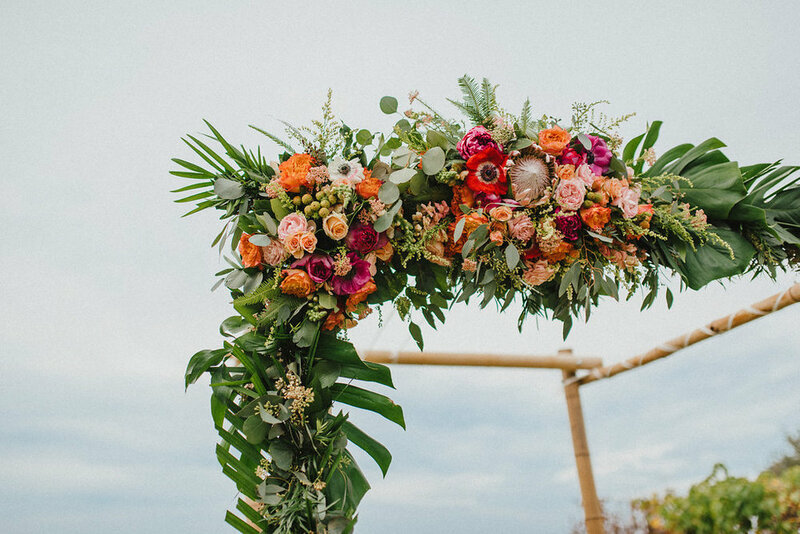 After you say your “I dos” head over to the grass area where you can celebrate with your family and friends while you enjoy the scenic views and watch the canoes gracefully float by on the ocean. The property also has a chapel on site for religious ceremonies that opens up to a stunning view of the ocean. If you prefer having an indoor event, the Four Seasons has ballrooms that are designed with every detail perfectly executed. 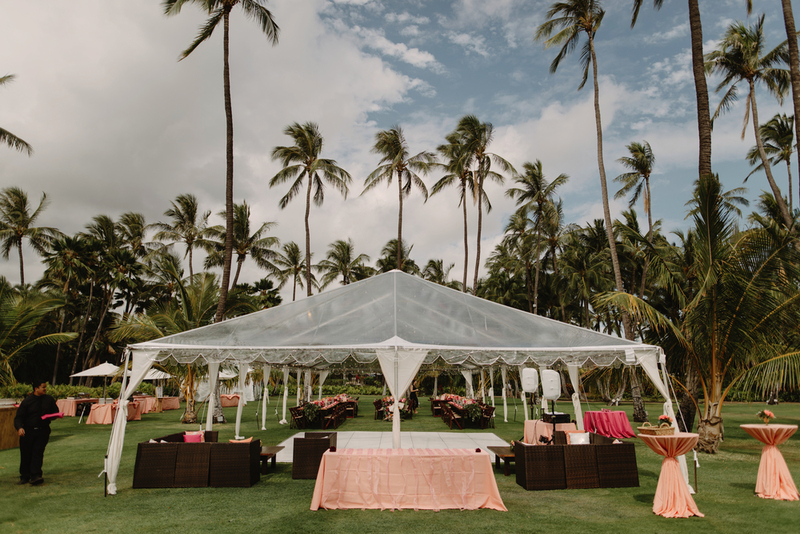 The Malolo Room, one of the larger event rooms, has floor to ceiling windows as well as a balcony to get an unobstructed view of the Waianae mountains. If you want something in between, you can have your intimate celebration in the veranda. With high vaulted ceilings and an open view to the fauna, pond and mountain views, it’s the perfect compromise. The Malolo room is the perfect space to have an indoor reception for larger parties. The outdoor veranda allows for an intimate celebration while enjoying the beautiful landscape around the property. Enjoy the serenity of the river running through the property. The chapel is available for religious ceremonies of any denomination. During your stay, enjoy sipping maitais at the adult infinity pool. .
With the opening of the Four Seasons in late 2016, it is one of the top luxury resorts on the island. 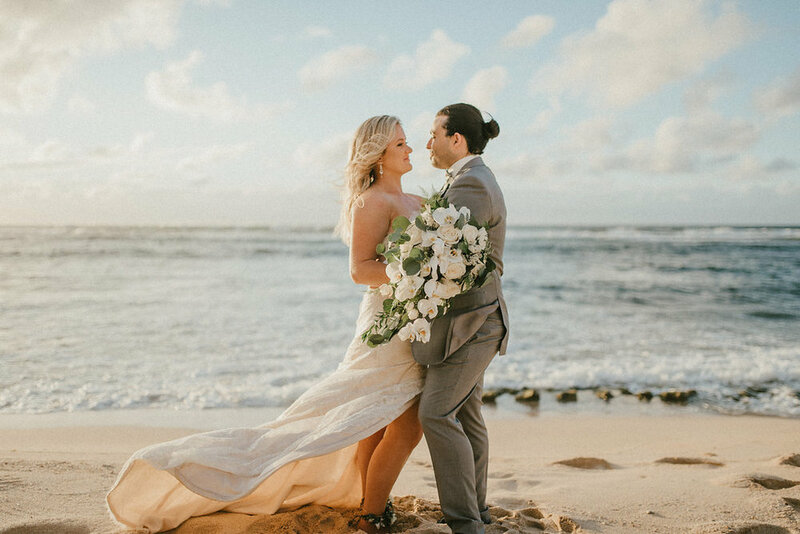 Enjoy a true luxury island experience outside of the bustling city and go home with the aloha spirit and a new husband or wife. For more information contact Amanda Belton at amanda.belton@fourseasons.com. This wedding was such a blast and full of surprises. Adrienne was such a sweet bride and so calm! It's so hard to do on your own wedding day, but when you know it's going to be an amazing day it's easy to be relaxed, yet excited. 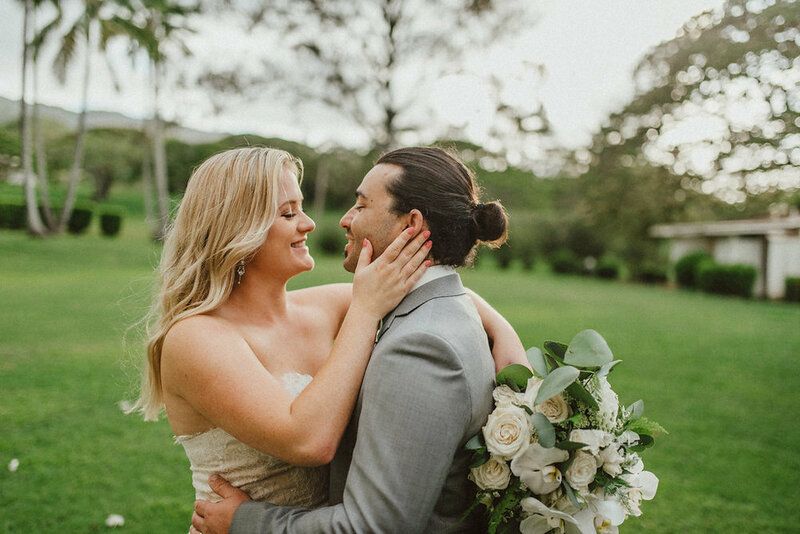 We had so much fun creating a modern take on the vintage pinup makeup look and designing an undo with the bride's bob length hair! It goes to show when your stylists are talented and knowledgable they can literally create anything. 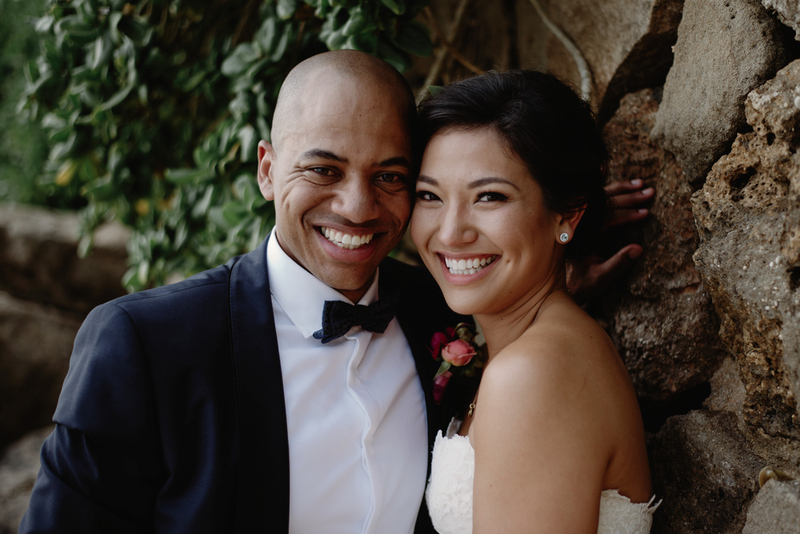 The Blush team wishes this beautiful couple all the love and happiness in the world on their new chapter. 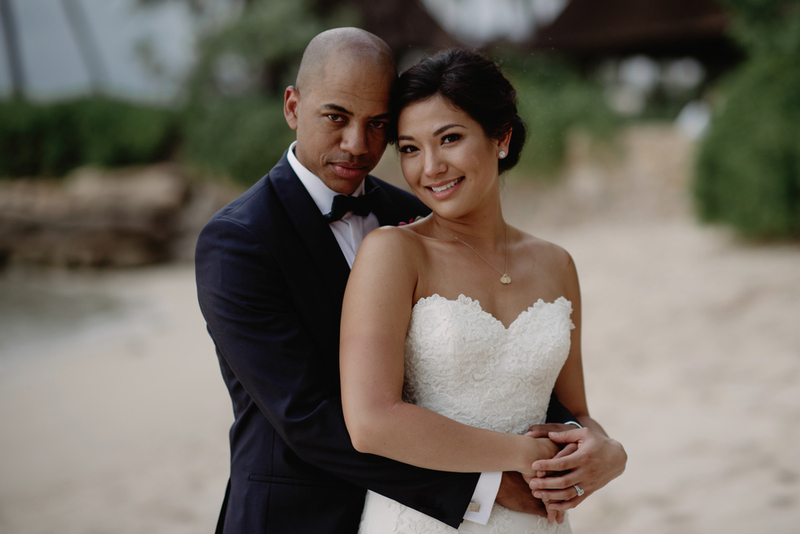 Adrienne + Hyatt // Highlight (Loulu) from ARIA Studios on Vimeo. 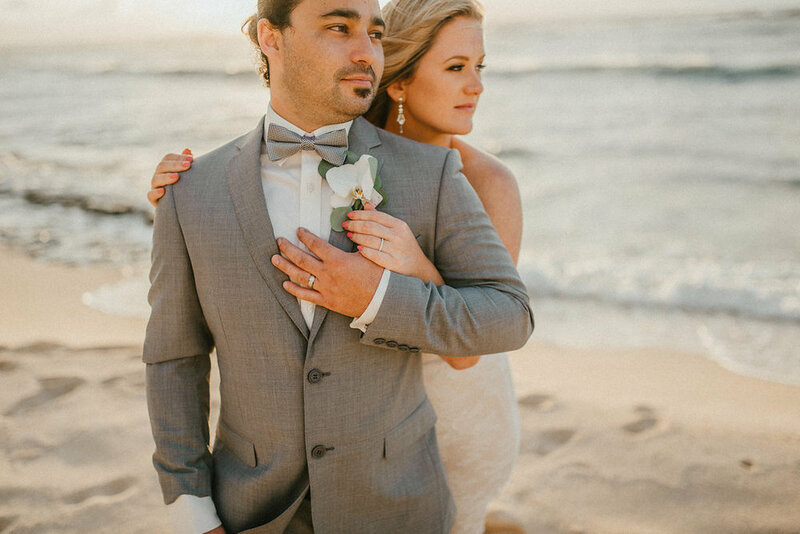 When we met this couple, we knew with the venue, vendors, and style, this intimate elopement would be one for the books. The beautiful bride wanted an all natural, glowing makeup look and soft, tousled, wavy hair style. We have to say she was the perfect paradise bride. 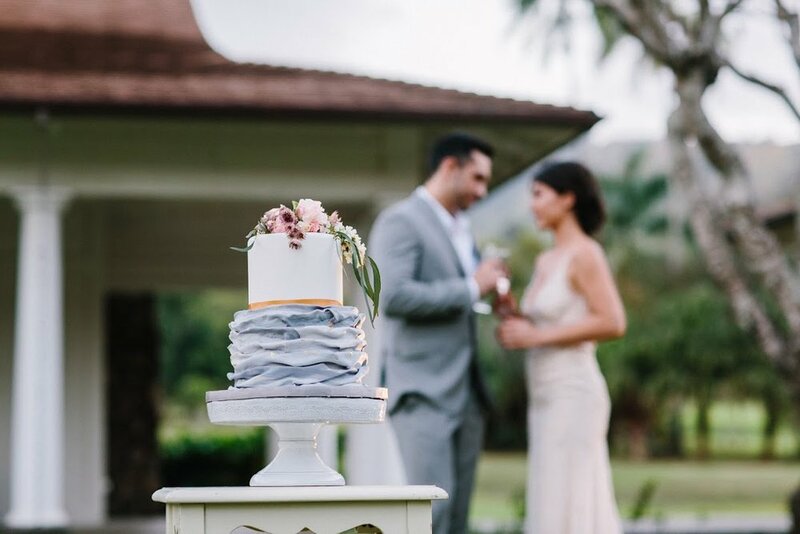 This all star list of vendors certainly made this couple's elopement a luxurious event that they will cherish. This wedding was one of our favorite weddings to date. 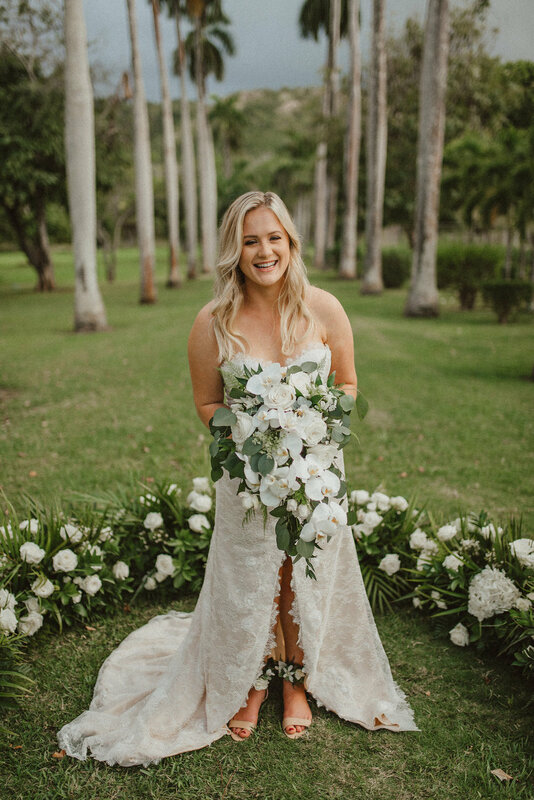 Our gorgeous bride worked for a company that deals with the likes of Kylie Jenner and Justin Bieber and was such a fun, laid-back bride. She opted for a modern take on the pin up look, so we did just that. We did a classic red lip and a kitten wing to give a little bit of glam. We also managed to create a romantic undo with her bob length hair. Our talented stylists really can create any style! Cheers to our fabulous couple! We wish them a lifetime of happiness!